Happy New Year! I often don’t make resolutions, but I am going to be more present on here from now on. How was your 2018 ring in? Any exciting events? I went to a party at my brother’s and sister-in-law’s house in which I drank waaaaay over my limit. Let me rephrase that. I think it was not so much the amount of drinks, it was the mixing of the drinks. I am sure you all know the consequences of consuming copious amounts of alcohol or mixing your poison, so I will save you the gory details. It appears I was drinking whiskey from the bottle (from Andy’s account) with my niece who was home from university, and that is all I remember. Who am I? I thought only dudes like Kid Rock drank whiskey from the bottle. Andy was the DD. The party was a lot of fun, and host and hostess made sure that everyone was enjoying themselves. The ride home was not much fun though and it felt as though my world was spinning. I had not had that much to drink since I turned 30, and tequila was the reason. Oh yes, there was also tequila on New Years Eve and I had a shot, as well as champagne. Oh the champagne! Suffice to say, on New Years Day I was bed ridden all day and did not surface from my bedroom until 11:00 pm when my appetite began to return. Yikes! 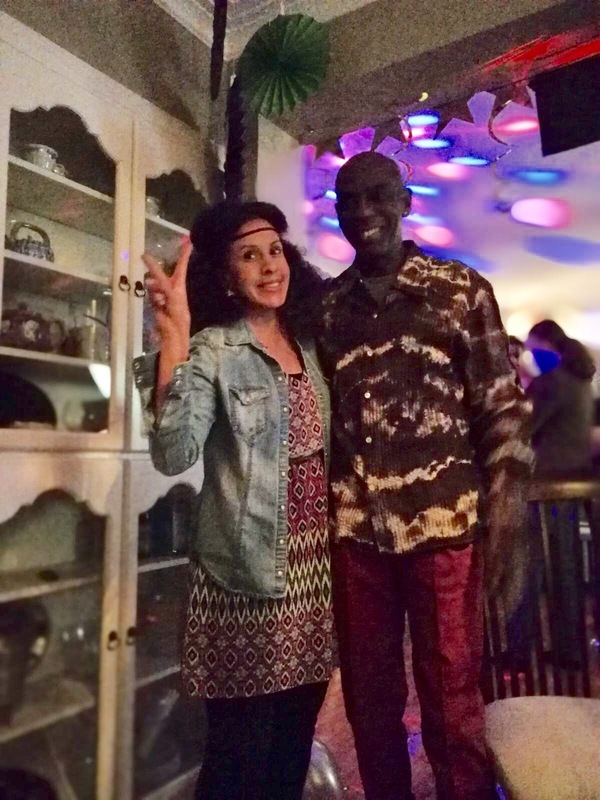 At least I had fun (from what I can remember) at this 70’s themed disco party. The song “Upside Down” by Diana Ross that I remember dancing to, took on a whole new meaning, as I tried to nurse my pounding head and brutal hangover the dreaded day after. It felt like everything was literally Upside Down and turning all day, but not for the reasons Diana sang about. I am sure she wasn’t singing about a hangover. Here is a picture before the tequila happened (and whiskey from the bottle). Still standing and fresh-faced. It was early in the party. We are experiencing an extreme cold alert here in Toronto. We are not getting a lot of snow like folks on the Eastern seaboard, but man that lake effect wind from the great lakes! Being outside after five minutes it literally feels like your face is burning from the windchill. I much prefer snowy days because the temperature rises and it is not so brutally cold, although the driving conditions can be treacherous. We just got new tires and I feel a little more confident driving when it is snowing. As the cold days keep many indoors, canceling flights to many U.S cities and setting back travel plans, I find myself complaining a lot. 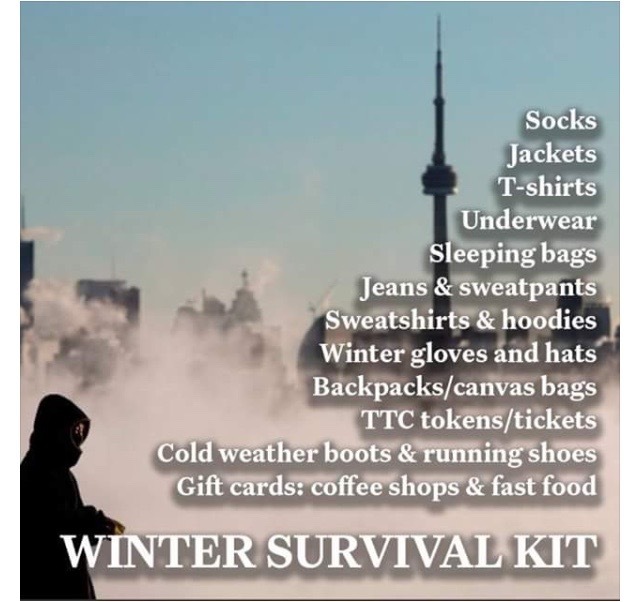 “I can’t take this.” “It’s so depressing.” “It gets dark so early.” “It’s too cold for this or that.” “The winter is sooooo long.” This complaining led me to looking at a post from Yonge Street Mission (a divine intervention perhaps?) Yonge Street Mission is an organization that assists homeless youth get their lives together through food, counseling, shelter and education. The post outlined things that homeless people might need during the winter months. This is when I thought about gratitude. I have a roof over my head. I have a warm bed. Praise God! There are many people out there who do not. Warm socks and subway tokens are small things that I often take for granted. That is when I said to myself, girl, you have got to stop this whining and be grateful. I immediately put together a care package that I plan to drop to a local shelter and prayed to have more gratitude in my heart. This is a struggle for me, and at times I find myself complaining too often when I should be giving thanks to God each day with more sincerity rather than going through the motions. Every morning I aim to Thank God for the things I often take for granted, and that could change in an instant. I plan to say them in mantras and let gratitude pour in mind, body and soul. Gratitude is an important place to start for me and a necessary place. Happy New Year! You back to being upside down the right way now? I often think about how the homeless deal with winter. A few weeks ago passing a homeless man and his dog I got him a blanket from the ‘lifestyle’ shop he was outside. It was more for the dog. The poor thing had a thick dirty old heavy cotton jumper which I know wasn’t keeping it warm. I help if I can, mostly giving money to those with dogs. They look after them better than themselves. It defiantly makes you think how lucky you are. Haha! Yes I’m the right way now. It’s a hard, long winter for the homeless. That is so true! The homeless people with pets really look after them. I guess because pets are faithful, loving companions during good and bad times. Love this! Gratitude is so important. Looks like you definitely had a wild NYE!! Whiskey from the bottle…WOO!! Y’all look cute in that pic tho! Thanks Chels. I really have to be more aware of this when I start complaining. Gratitude is the key to happiness or else we will always be cribbing and unhappy!